Shortlisted as PI/Clinical Negligence Silk of the Year 2017. 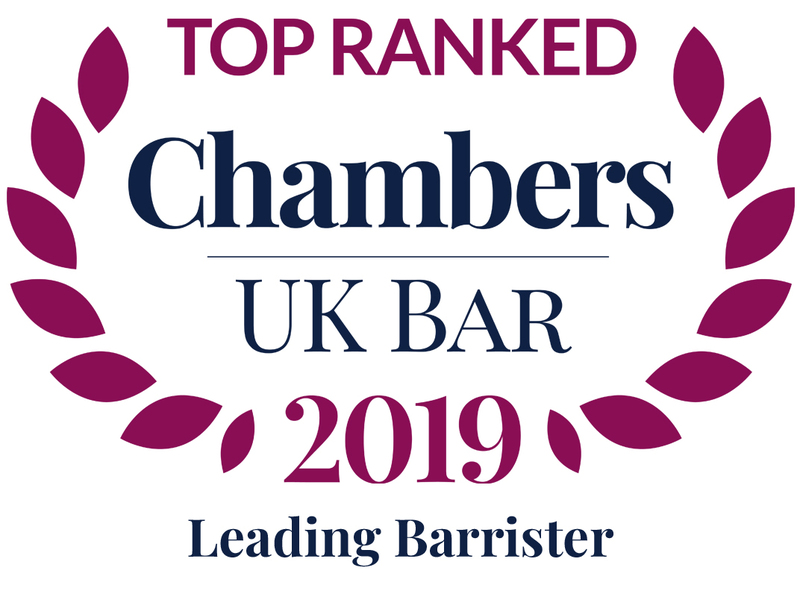 Simon was again recommended in 2018 by the Legal 500 and Chambers UK as a Leading Silk in a number of Practice Areas. He is an experienced litigator and advocate, be it in the fields of insurance, professional negligence and professional regulation, catastrophic brain and spinal injury or costs and litigation funding. Another area of expertise is conducting Group Litigation, most notably in the civil phone hacking litigation concerning News of the World and the Mirror Group. As a Leading Silk he is at the very forefront of the development of the law and procedure in the higher courts. Simon was lead counsel in Richard Slade v Boodia – Court of Appeal , Mitchell v News Group Newspapers – Court of Appeal , Yentob v MGN – Court of Appeal , Briggs & 598 Ors. v First Choice Holidays Limited – High Court , Frost v MGN – Supreme Court , and BNM v MGN – Court of Appeal . In addition to his highly praised oral and written advocacy Simon drafts highly complex and high value legal documents. He has been instructed in a number of high profile cases for well-known individual and corporate clients acting for both Claimants and Defendants. He has regularly acted in claims concerning both UK and foreign jurisdictions, including disputes occurring offshore concerning breach of duty and contract. He is qualified as a Mediator and Arbitrator. Simon Browne QC is “an excellent leading counsel, and is always fully prepared be it for advising in consultation or presenting in court” and is recommended by the Legal 500 as a Leading Silk. A very “dedicated and intellectual” practitioner one of the best is Simon Browne QC, a lawyer who views the client’s needs as paramount and is “on top of his game. His seamless advocacy and client-handling skills make him an extremely popular choice; he is “an extremely personable” silk who “crucially gets on really well with judges”. Recommended as being ‘very much in the top bracket’ and as a Leading Silk – and further described as a “combative counsel with an assertive presence”. He is “reliable and produces very detailed and is noted for the thoroughness with which he goes about his business” and all clients “greatly appreciate his insight into claims”. Simon Browne QC (leading Marcus Grant) represented the Claimant who was left with enduring neuro-psychiatric and vestibular symptoms after a modest blow to the head. The Claimant was 39 at the time of the accident and the principal breadwinner for his family. He had a pre-accident history of psychological vulnerability. Simon Browne QC, instructed by Alan Mendham of Gadsby Wicks, represented the Claimant (now aged 10 years) who was injured as a result of negligent procedures during his birth in the Defendant’s hospital. The Claimant is severely disabled by quadriplegic dyskinetic cerebral palsy level 4/5, having suffered damage in the deep grey matter of his brain. He will require assistance from multiple carers at all times for the rest of his life. Settlement on liability was previously reached whereby the Defendant was liable to the extent of 70%. Having delivered his judgement in Wave 1 of the phone hacking claims against the Mirror Group Newpapers, the Senior Costs Judge delivered a further judgment in the Wave 2 claims upon the test of proportionality and, in particular, how the value of the claim should be assessed and taken into account. Simon Browne QC represented the successful phone hacking victims in this landmark case. The Senior Costs Judge delivered am important judgment as to the application of the test of proportionality and how its constituent elements should be applied. Simon Browne QC represented the successful phone hacking victims against Mirror Group Newspapers in this landmark case. Simon Browne QC successfully represented a QOCS-protected Claimant against an application to enforce an adverse costs order made by a Defendant against whom she had discontinued her claim, having been successful and received damages from the other Defendants. Three national newspapers (The Times, Daily Mail, and The Mirror) were attempting to avoid paying any additional liabilities (success fees and ATE premiums) to privacy and defamation claimants funded by conditional fee agreements. The challenge was based upon the newspapers’ freedom of expression under Article 10 of the European Convention of Human Rights. Simon Browne QC, representing 599 holidaymakers who fell ill at a resort, successfully appealed against a decision certain claimants should have engaged in ADR prior to progressing their claims through the courts. Mr Justice Singh in delivering his judgement enunciated two important points of principle concerning the use of ADR. Supreme Court. Newspaper Article 10 challenge to the payment of Additional Liabilities. Simon Browne QC appeared for 23 separate Respondents in a three day challenge in the Supreme Court by the Appellant Newspaper (The Mirror) to pay success fees and after the event insurance premiums to successful litigants in publication cases, namely the phone hacking litigation. The newspaper argued that the payment of such additional liabilities amounts to a breach of their Article 10 right to freedom of expression under the Human Rights Act. Simon Browne QC represented the insurers of the bus company in this case of both personal injury and insurance law. The Claimant was a blameless pillion passenger on a motor cycle suing the rider and the bus company for an accident rendering her seriously injured as he crashed at over 70mph. The Estate and RTA Insurer of the deceased rider admitted liability. Nevertheless they (1) sought to apportion some negligence against the co-defendant bus driver and (2) more importantly sought to avoid the motor cycle policy of insurance. Appeal concerning legal professional privilege between the parties on a solicitor client assessment. Instructed as common costs counsel for the group litigation claimants arising out of mobile telephone voicemail interception against the Mirror Newspaper Group. Instructed by Dechert on a £15 million dispute and the determination of the appropriate forum for litigation in the High Court. Simon Browne QC successfully upheld the Part 36 costs order in favour of Alan Yentob in the Court of Appeal. Mr Justice Mann had made no order for costs after Mr Yentob was awarded £85,000 but failed to beat Mirror Group’s Part 36 offer. The justice of the case demanded that Mr Yentob was not to be penalised in costs. Nicola Davies J. Award equating to £14 million for teenager with complete tetraplegia. The Court approved settlement provided for a lump sum of £3.2m plus annual periodic payments for aids, therapies, 24-hour care and loss of earnings. Although the award is equivalent to £14m over her lifetime the insurer provided a reverse indemnity for care provided by the PCT which was mutually beneficial to both parties. Led by Simon Browne QC on behalf of a claimant who suffered serious leg injuries in a road traffic accident. The claimant was a diabetic and the injury led to a below knee amputation. The claim involved complex future loss claims and life expectancy issues. The claim settled at a JSM in 2013 for around £850,000 on a full liability basis. Appellate decision on the exercise of the court’s discretion on costs when successful Claimant recovered less than 6% of the original pleaded claim, and where trial judge failed to consider the reasonableness of a Calderbank offer made by the Defendant. Representing the MP, Andrew Mitchell, in the Court of Appeal in the well-known relief from sanction / cost-budgeting appeal. Simon Browne QC and Shaman Kapoor are contributors to the Spring Edition of the PIC Magazine. The Pitfalls of Refusing ADR by Simon Browne QC. The Heat is On by Shaman Kapoor. Simon Browne QC, instructed by Alan Mendham of Gadsby Wicks, represented the Claimant (now aged 10 years) who was injured as a result of negligent procedures during his birth in the Defendant’s hospital, Southend University NHS Trust. TGC are delighted to announce that Jonathan Watt-Pringle QC and Simon Browne QC have been shortlisted for the Silk of the Year award for Personal Injury and Clinical Negligence for the forthcoming Legal 500 awards. In costs proceedings for the Various Claimants v Mirror Group Newspapers in the phone hacking litigation, indemnity costs were awarded against the Defendant’s unreasonable failure to engage in the process of discussing at least the possibility of alternative dispute resolution, and mediation in particular. In this severe cerebral palsy claim Simon Browne Q.C., instructed by Gadsby Wicks Solicitors, secured a judgment for liability against Southend University Hospital NHS Foundation Trust. Further he secured an anonymity order restricting media reporting identifying the infant litigant. I am registered with the Information Commissioner’s Office (ICO) as a Data Controller for the personal data that I hold and process as a barrister. My registered address is Temple Garden Chambers, 1 Harcourt Buildings, Temple, London EC4Y 9DA and my registration number is Z8747687. The vast majority of the information that I hold about you is provided to or gathered by us in the course of your case and/or proceedings. Your solicitor (if applicable) and/or I will tell you why we need the information and how we will use it. Our Lawful Basis and our Legitimate Interest is the first in eac category and any others from time to time which may arise. If this was to occur I shall satisfy myself that such transferred data is fully protected and safeguarded as required by the General Data Protection Regulation. You may request access to, correction of, or a copy of your information by contacting me. I will occasionally update my Privacy Notice. When I make significant changes, I will also publish the updated Notice on my website profile.